You can get a FREE and instant online valuation for your car with webuyanycar.com, perfect for those looking to sell their SEAT! Spanish automotive manufacturers, and sister brand to Volkswagen, SEAT produce a stylish range of cars for the UK car market. Popular models, such as the ‘SEAT Leon’, receive regular upgrades and redesigns. Newer models include a ton of great modern features, such as touchscreen displays, satellite navigation and more. To get a quick and easy valuation for your SEAT, enter your number plate into the box above to get started! The SEAT Mii is a small, affordable city car with a range of economic engines that help to reduce running costs, making the Mii perfect for first-time buyers. It is simple in design, handles well at speed and is surprisingly practical despite its size with a decent sized boot and spacious rear seats. The SEAT Ibiza is a small hatchback that outshines those in its class when it comes to style. Practical features include a good-sized boot, bigger than the boot on the Ford Fiesta, a spacious rear and plenty of storage pockets. With a variety of trims, you can customise the specifications of the car to suit your own needs and tastes. The SEAT Toledo is a large saloon with ample space for the family and luggage. 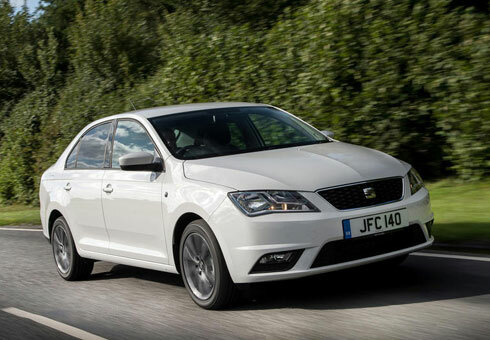 SEAT has focused on the comfort and practicality of this model to keep the whole family happy. Low running costs are great on the wallet too! The SEAT Leon is a large hatchback based on the Volkswagen Golf. With an improved design from the Toledo and more fun to drive, it can be a more exciting option, but it costs more too. Available with a good range of engines, including many eco-friendly options with low-running costs. The SEAT Ateca SUV combines style and practicality to compete against the best in its class. The Ateca comes with three trims, but that’s all it needs when even the entry level is equipped with a 5-inch touchscreen entertainment system and alloy wheels. The rear seats are spacious and comfortable, making for a great family car. For ultimate practicality, the SEAT Alhambra is superb. The seven-seater MPV is spacious, with the ability to flatten all its passenger seats to create a huge loading bay. The Alhambra is well equipped to compete against the model it is based on, the Volkswagen Sharan. You can’t argue with how family friendly it is. Sharing the strong build of the Volkswagen Lupo but at a more affordable price, the SEAT Arosa is a good choice for a small town car. It drives well around the city with great handling around tight corners and is good value for money. The SEAT Altea has some serious practical features. The small people carrier boasts a large boot with extra storage space under the floor, and the ability to completely flatten the rear seats for an even larger loading bay. The good build quality, ample safety features and great handling make the Altea a superb affordable family car. Are you thinking about selling your SEAT but want to know how much it could be worth first? Here at webuyanycar.com, we can provide a free and instant valuation without you even leaving your home! Enter your number plate into our valuation calculator above and answer a couple of questions to provide us with a better picture of your car and its condition. From this information, the value of the car will be estimated in seconds. It’s that simple! There is no obligation to continue with the webuyanycar.com service after this point, but if you wish to, your value will be guaranteed for the next 7 days, assuming your vehicle is in the condition it has been described to be in (subject to inspection, price may change). We provide a simple online service that has been rated 5 stars by our customers on Trustpilot, so why not give it a go. How can I sell my SEAT? Selling your SEAT to webuyanycar.com takes no time at all thanks to our quick and simple process. Follow our step-by-step guide and sell your car today. Find out how much your car is worth via the car valuation tool. Enter your number plate and your car’s value will be calculated in seconds. The valuation will be guaranteed for 7 days with no obligation to sell, to provide plenty of time for the next stage. Book an appointment at a branch near you. We have 250+ locations nationwide for your convenience. During your appointment, your car will be inspected by one of our industry experts to check the condition of the car and will offer a fair deal. Sell your car and you could have the cash the same day. When should I sell my SEAT? Timing the sale of your SEAT just right is beneficial to gain the best possible valuation for your car. However, it can be difficult to judge when the best time is. With a couple of tips from webuyanycar.com, we will help you figure this out. While age is an important factor when it comes to the value of a car, the time of year is a crucial element to consider. Every March and September brings the introduction of the new number plate, recognising older vehicles as another year older. Therefore, it is advisable to sell your car before the next plate change. Time of year should also be considered depending on the type of car that is being sold. For example, if you own a convertible, the market will value this vehicle more in the summer than it will in the winter, due to the demand for this style. It is also worth noting that the mileage can affect the value of the car. Therefore, if the vehicle is driven for long journeys on a regular basis, you may want to upgrade before it clocks too high a mileage. The rate at which a car depreciates is dependent on a number of variables including the make and model of the car, the age and condition of the car, and the market value. Together all of these factors affect how much your SEAT could be worth. If the car has been treated well and is in good condition, with a low mileage, then there is more chance to retain as much value as possible. The demand for your vehicle will also affect how much it could be worth. If you’re selling your SEAT when it is in high demand, then you could get more for it. If you’re thinking of selling your SEAT before it depreciates anymore, get your instant valuation with webuyanycar.com.